Automotive multi-domain controller, also known as multi-domain control unit, is an integrated electronic controller that improves functionalities and offers the electrically powered system of the vehicle bulk data to process for automated driving. The automotive multi-domain controller handles high volume of data generated from the currently connected vehicles and integrates numerous sub-electronics systems to function smoothly and efficiently. The automotive multi-domain controller reduces the network space and complexity caused due to extensive use of multiple electronic control unit or module. The average number of electronic control units in premium, luxury, and high-end vehicles has been rising since the last few years. Rise in vehicle electrification fuels the demand for efficient management of the intricacy of electronics and electronic architecture in automotive. Higher number of electronic control units, owing to advancements in the field of technology to offer more safety and comfortable vehicle ride, leads to complexity of electronics and electronic architecture in the vehicle. This is a major factor that is anticipated to boost the automotive multi-domain controller market during the forecast period. The automotive multi-domain controller offers numerous benefits such as reliability, reduction in complexity, cost-effectiveness, enhanced durability, reduction in weight, and higher efficiency. Additionally, the advent of disruptive trends such as semi-autonomous, autonomous, connected, and electric vehicles, which are anticipated to boost the demand for electronics in automotive, is another important factor that is anticipated to boost the automotive multi-domain controller market during the forecast period. Furthermore, rapid demand for easy to customize and tailor electronic network architecture as per the requirement coupled with cost-effective alternate solution with minimum time are key factors that are likely to drive the automotive multi-domain controller market in the near future. Despite its multiple benefits, the automotive multi-domain controller market faces a couple of restraints. Its cost, which is quite cost-effective solution for high-end cars, is relatively high for entry level cars that are contain very few electronic control units. Consequently, penetration of multi-domain controller in these cars is low as only a few electronic control modules are sufficient in entry level cars. Another key drawback of the multi-domain controller is the possibility of malfunction of the product, as the entire system is operated electronically, which may lead to false or erroneous interpretation and operation of the component. This, in turn, can lead to loss of complete control, thereby hampering the safety and comfort of the vehicle ride. These factors are likely to hinder the automotive multi-domain controller market during the forecast period. The global automotive multi-domain controller market has been segmented based on application, vehicle type, propulsion type, and region. Based on application, the automotive multi-domain controller market has been bifurcated into advance driver assistance system (ADAS) & safety, engine & powertrain, chassis & body control system, cockpit, and others. The advance driver assistance system (ADAS) & safety segment hold a major share of the automotive multi-domain controller market primarily due to the increasing demand for safety and security while driving. In terms of vehicle type, the automotive multi-domain controller market has been divided into passenger vehicle and commercial vehicle. Passenger vehicle is a highly attractive and lucrative segment of the market. Rise in electrification in vehicles coupled with increasing demand for safety and comfort is anticipated to boost the segment of the market during the forecast period. The segment is projected to expand at a significant growth rate during the forecast period. Based on propulsion type, the automotive multi-domain controller market has been classified into battery electric vehicle, hybrid vehicle, and internal combustion engine vehicle. The internal combustion engine vehicle segment dominated the automotive multi-domain controller market primarily due to a surge in integration of the component in internal combustion engine powered vehicles and limited availability of alternative vehicles. However, higher demand for zero or low emission vehicles is likely to hamper the segment in the near future. In terms of region, the automotive multi-domain controller market has been segregated into North America, Europe, Asia Pacific, Middle East & Africa, and Latin America. Europe is projected to hold for a prominent share of the global automotive multi-domain controller market, as the region is home to a majority of global automakers and original equipment manufacturers who are pioneers of the automotive multi-domain controller. Moreover, the presence of major premium and exotic vehicle manufactures coupled with the demand for cost-effective and efficient solutions is also likely to propel the market in the region during the forecast period. The market in the region is likely to expand at a significant pace during the forecast period. Major players operating in the global automotive multi-domain controller market include TATA ELXSI, Visteon Corporation, Robert Bosch GmbH, Continental AG, Sasken Technologies Ltd, Delphi Technologies, Mobileye, NVIDIA Corporation, Infineon Technologies AG, KRONO-SAFE, NXP Semiconductors, Autoliv Inc., ZF Friedrichshafen AG, and Texas Instruments Incorporated. This report analyzes and forecasts the market for automotive multi-domain controller at the global and regional level. The market has been forecasted based on volume (thousand units) and value (US$ Mn) from 2018 to 2026. The study includes drivers and restraints of the global automotive multi-domain controller market. It also covers the impact of these drivers and restraints on the demand for automotive multi-domain controller services during the forecast period. The report also highlights opportunities and future scope in the market at the global and regional level. The report comprises a detailed value chain analysis, which provides a comprehensive view of the global automotive multi-domain controller market. The Porter’s Five Forces model for the market has also been included to help understand the competitive landscape in the market. The study encompasses market attractiveness analysis, wherein the service is benchmarked based on market size, growth rate, and general market share. 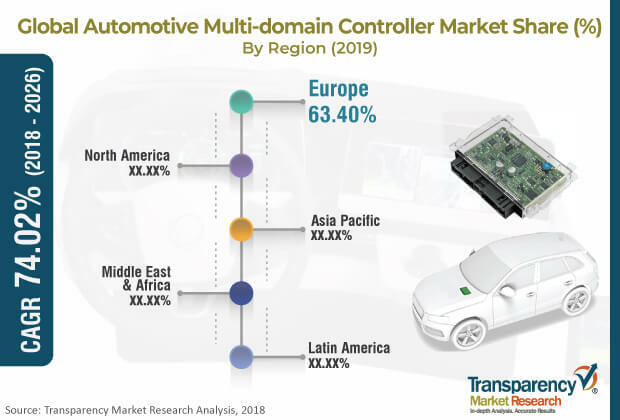 The study provides a decisive view of the global automotive multi-domain controller market by segmenting it in terms of application, vehicle type, propulsion type, and region. These segments have been analyzed based on present and future trends. Regional segmentation includes the current and forecast demand for automotive multi-domain controller in North America, Europe, Asia Pacific, Latin America, and Middle East & Africa. The report also covers the demand for individual segments in all major countries across all the regions. The study includes profiles of major companies operating in the global automotive multi-domain controller market. Market players have been profiled in terms of attributes such as company overview, financial overview, business strategies, and recent developments. The global automotive multi-domain control market is primarily driven by the simplicity of vehicle electronic structure utilizing the multi-domain controller. Utilizing a multi-domain controller eliminates the necessity for several ECUs and hence, the number of electronic components decreases, resulting in a simple electronic structure. Emphasis on component downsizing and enhancement of reliability of electronic components by vehicle manufacturers are fueling the demand for multi-domain controller across the globe. The report provides the market size of automotive multi-domain controller for 2017 and forecast for the next nine years. The global market size has been provided in terms of volume and value. Market numbers have been estimated based on application, vehicle type, propulsion type, and geography segments. Market size and forecast for each application, vehicle type, and propulsion type have been provided in terms of global and regional/country markets. In order to compile the research report, we conducted in-depth interviews and discussions with a number of key industry participants and opinion leaders. Primary research represents the bulk of research efforts, supplemented by extensive secondary research. We reviewed key player’s product literature, annual reports, press releases, and relevant documents for competitive analysis and market understanding. Secondary research also includes a search of recent trade, technical writing, internet sources, statistics, data from government websites, trade associations, OICA data, and agencies. This has proven to be the most reliable, effective, and successful approach for obtaining precise market data, capturing industry participant’s insights, and recognizing business opportunities. Secondary research sources that are typically referred to include, but are not limited to company websites, annual reports, financial reports, broker reports, investor presentations, and SEC filings, internal and external proprietary databases, and relevant patent and regulatory databases, national government documents, statistical databases, and market reports, news articles, press releases, and webcasts specific to companies operating in the market, National government documents, statistical databases, and market reports, JAMA, SIAM, Department of Transportation, Factiva, etc.